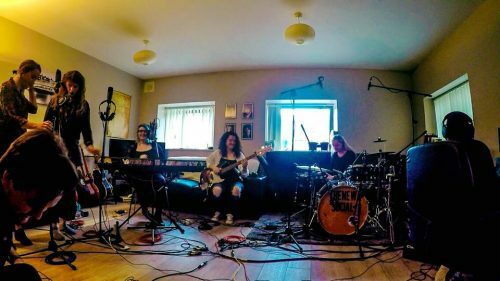 Project 82 is a series of intimate live performances recorded in a home studio, based in the heart of Dublin City. We’ve been working to create a platform for emerging talent with original music to record with our in-house sound engineer Anna Brizay, while behind the lens is Nathan Dunne our in-house cinematographer. Encompassing all genres of music Project 82 wants to become the number one showcase for homegrown Irish talent and the go-to Youtube channel for people looking to hear something fresh. All the artists that have been involved have loved the experience and have been happy with the quality content we released. We hope artists/bands of any kind will approach us…if we like it we’ll record it. For the moment this is a non-profit organization, we recently set up a crowdfunding via Patreon where people can donate per video and in return, we reward our pledgers. Any of the money we do make on this will go towards improvements for the project like acoustics, microphones, lighting etc..
You can stay updated with all the upcoming episodes on our Instagram, Facebook and Twitter pages, we also have a SoundCloud that features all songs recorded in the series. Visit our website for all other information. If you are an artist with original music and would like to be featured on our show, please contact us at info@projecteightytwo.com with a link to your music, we would love to hear from you. What a wonderful Idea and very helpful to young Independent Artists today.. These guy need as much support as possible . Not too much of this type of help around and it much be applauded . Very well done guys and you have my support.. Brilliant idea. I can see the queues forming around the block already..This is gonna be greatly Appreciated..